Your GreenGeeks hosting account includes the ability to customize PHP environment variables without the assistance of our technical support staff. This tutorial will show you how to make changes to the PHP version and environment variables using our cPanel interface. In order to customize your PHP settings, you must select a custom PHP version. 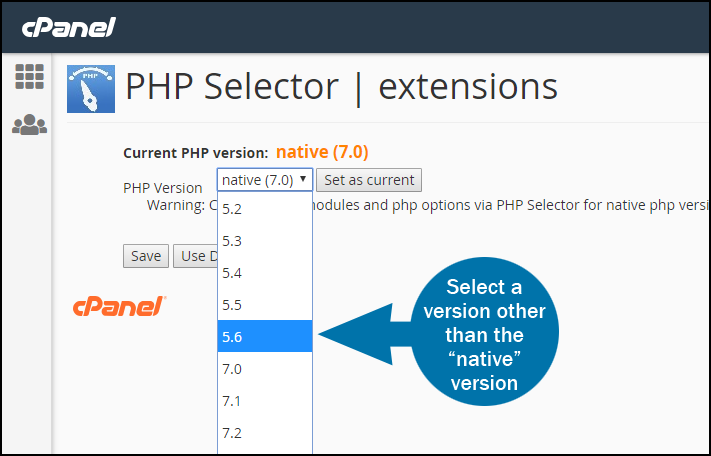 You cannot change the PHP settings for the native (default) PHP version. Log in to your GreenGeeks Account Manager and go to your cPanel Account by clicking the “cPanel Login” button in the “Quick Server Login” section. In the “SOFTWARE” section, click the “Select PHP Version” link or icon. Select the version you wish to use. By default, the latest stable version (called the “native” version) will be selected and is already active. So if you wish to use the native version, you cannot change the PHP settings. Click the “Set as current” button, then scroll down. 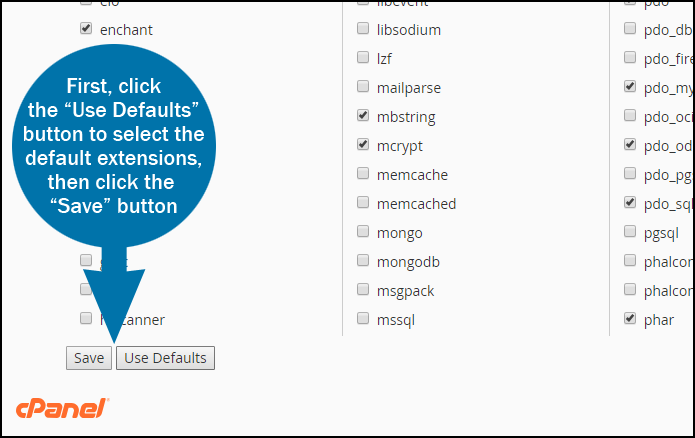 1) Click the “Use Defaults” button to select the default extensions. 2) Click the “Save” button. To change the PHP settings, click the “Switch To PHP Options” link. To make changes simply click the grey text, enter or select the setting change, and click the “Apply” button. Click “Save” when you have completed all of your modifications. Name the file phpinfo.php and upload it to the root directory of your site. Visit http://ggexample.com/phpinfo.php to view the PHP settings (replacing ggexample.com with your domain name). This article is lacking in detail and all attempts I’ve made at implementing a custom php.ini workaround have not worked. My current WordPress installation has a max file upload size of only 1MB and my php.ini in the root directory has a setting of 30MB. The article should be updated with a sample php.ini (complete). Thank you for your comments, modifying PHP.ini files has always been a difficult/confusing process. GreenGeeks is proud to announce, a new & easier way of managing your PHP.ini files directly from your cPanel account. Take a look at the updates and contact support if you have any further difficulties. Any attempts to use php 5.3 or 5.4 result in a configuration error on any php script I try to execute. Even with default settings and includes. Are you sure that your PHP scripts are coded to work correctly with 5.3 and 5.4? Check with the developer of the script. If your script is compatible, send in a ticket via the Account Manager and one of our technicians will look into this for you. I run a Denver cleaning service> and I administer the website also. I have a background in IT back end systems but I’m a novice on front end systems and web stuff. I love Green Geeks. They have provided me the best support ever. Support actually directed me to this link. I love that we have access to cPanel with the GUI admin tools. It makes life much easier for we who do not modify code files often. This functionality is only available on our Shared & Reseller hosting services. VPS servers are restricted to one PHP version (5.4 by default) and support the traditional php.ini functionality. Now that php 5.5 is “end of life” (no actively being supported and no security fixes after July 10, 2016, does GreenGeeks have a migration plan? Will you go to 5.6, or jump directly to 7? P.S. It’s been almost three years since you updated this Knowledge Base item – maybe it’s time the article said that you’re on 5.5 and what your plans are. GreenGeeks actively maintains the PHP version libraries even after they are publically no longer supported. So how do I set outside of the 2 or 3 suggested variables? For example: You encourage the installation of Moodle through Softaculous apps installer, however if I want to download all students work at once or even if serveral of them are uploading at once the max I can set “max_execution_time” to is a whopping 90 sec. Also know as internal server error 500 request timed out. So it looks like you’re on 5.6 now, at least that’s what I’m seeing on PHP Selector. It says that changing options is impossible. I need to change the upload_max_filesize and the post_max_size settings. I need both to be 20MB. Any way this can be done? Simply contact our support team via live chat, e-mail or telephone and they’ll be able to assist you with your request.